Just three months before Jay Clark and partner Caroline Donoghue welcomed their first baby following a long struggle to conceive via IVF, Jay was diagnosed with incurable pancreatic cancer. In the face of this devastating news, new dad Jay is determined to approach life with cancer with as much positivity and dignity as possible. It was not the only cruel blow dealt to this lovely family. 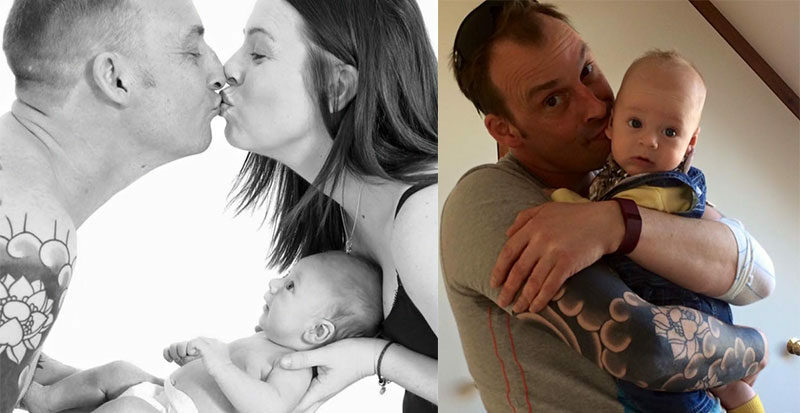 Unfathomably, just a few months after baby Maxie’s birth, Jay’s mum died from breast cancer. “It was so, so cruel. There were tears. But we tried to remain strong. With a newborn it’s the only option. Jay was amazing, offering comfort to everyone,” Caroline told The Mirror. After his mum passed away, Jay decided to cease radiotherapy and concentrate on having optimal quality of life, as he spends as much time as possible with his little boy and partner. Not only is he making every moment with baby Maxie count, he’s documenting all his dad-ventures on his Be More Jay Facebook page. Jay realised something was amiss just a few months before Maxie was born in January. Caroline was 7 months pregnant at the time, and Jay was suffering terrible abdominal pain. It was when he began to appear jaundiced that he sought medical advice. Doctors discovered that a tumour was pushing on Jay’s bile duct, causing the jaundice and providing a clear warning sign that something was very wrong. His medical team quickly diagnosed incurable pancreatic cancer. As the family come to terms with this devastating news, they’re keen to raise awareness of the symptoms of this often ‘silent killer’. Pancreatic cancer is often only discovered when sufferers have just days to live. While managing his illness is gruelling and emotional, the new dad is trying his hardest to keep time with Maxie as joyful as possible. Jay says he hopes his little boy will continue this tradition of approaching life with positivity. He wants Maxie to know that he’s very loved by his dad. “I hope he’s kept his personality and is still making people laugh as much as he made his Daddy laugh. I want him to know that Daddy misses him and he will always miss him,” Jay told The Mirror. Fans of Be More Jay say that Maxie, Caroline and Jay’s adventures remind them of what truly matters. “Thank you for reminding me of what is truly important. You are a lovely and blessed family,” one follower wrote. “You are an inspiration to others. You are handling this nasty disease so well, I have loved looking at your happy family pics. You are making so many beautiful memories for your lovely wife and gorgeous son,” another posted. These end-of-life decisions must be impossibly difficult to make and we’re very privileged to be able to witness this family’s journey. Hopefully this will arm us with more information about navigating challenging times, spark discussion about end-of-life care, provide perspective on what truly matters and make us more aware of the symptoms of insidious diseases like pancreatic cancer.